Droplets of rain hammering the floor, at first light and then deafening. Clouds of mist rising, obscuring, shifting the landscape. Bodies finding shelter in one another. It begins on Pero’s Bridge, a slender strip of metal suspended over the water at Bristol’s harbourside. 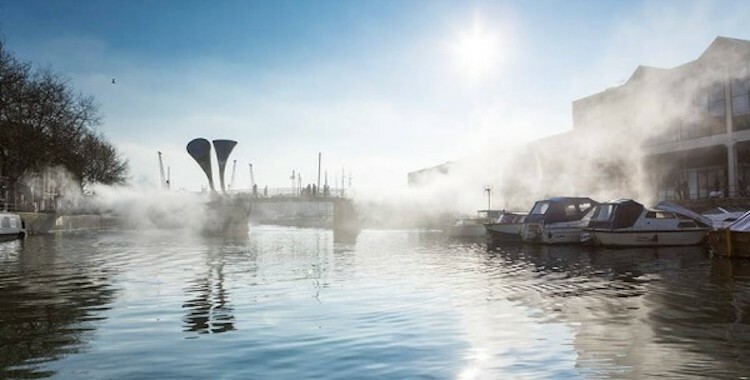 At intervals, Fujiko Nakaya’s fog sculpture envelops the bridge and the surrounding water, billowing in whichever direction the wind catches it. From a distance, figures hover insubstantially, as though walking on clouds; stepping across feels like a small act of trust, as the mist blurs the view ahead. Mostly it’s an interruption in the architecture of the city, an instance of surprising, unexpected public art. Passersby pause to take photographs, while others linger in the fog that clings to hair and clothes. It’s a novelty, an attraction, an invitation. Placed in the context of Bristol’s status as European Green Capital, however, it acquires more significance. Considered alongside the potentially catastrophic changes occurring to our climate, Fog Bridge feels anticipatory, its delicate beauty foreboding. It might be fog today, but what will it be tomorrow? This is just the calm before the storm. Teenagers are often seen as something of a gathering storm themselves, anarchically brewing trouble. But Canadian company Mammalian Diving Reflex ask us to see them – and ourselves – differently. On Saturday evening, following a coach journey into the dark, a group of teens lead us on a sprawling and chaotic roam through streets and fields, powerless to do anything but follow them. The usual power dynamic is flipped. As with Fog Bridge, there’s a sense of event. Our large group of walkers swells through the streets, observed by curious figures through parted curtains. It’s an unruly disruption, but not of the kind we’re used to associating with urban teenagers. Nightwalks with Teenagers is rebellious but gentle, riotous yet tender. We are instructed to hold hands, to hug one another, to gather close. From the beginning, a fragile sense of community is created. This begins to break apart as we trundle through suburban streets and along treacherously muddy paths. The audience is large and spread out, inhibiting the intimacy that the event seems to be reaching for. It’s full of individual moments, though, that are both striking and bizarre: a panoramic view of the city laid out below us, lights twinkling in the gloom; an invitation to dance; a rowdily improvised bit of storytelling; and, perhaps strangest of all, a detour to a house with a Mini Cheddar-loving pet duck. Our adolescent guides revel in it all, taking up the reins with glee. If this generation are the coming storm, then bring on the downpour. Rumblings of thunder shudder through True West, Lone Twin’s unique take on and around Sam Shepard’s domestic play. Gregg Whelan and Gary Winters are Shepard’s pair of brothers, locked in bitter and often absurd rivalry, while a chorus sat around a table stand in for all the other roles. It’s small and low-fi, but somehow oddly explosive. There are gloriously naff sound-effects, showers of multi-coloured confetti, overflowing cans of beer and a brilliant moment with a golf club and an ill-fated toaster. For all the stuff, though, it feels more like a story about stories: how we tell them, who tells them, how our culture has encouraged us to shape them. Delivered deadpan by Whelan and Winters, lines from the “authentic” Western one brother is writing leap out in all their ridiculous beauty. In their programme note, Lone Twin describe True West as a “cover version” of Shepard’s play. It’s an appealing way of describing their relationship with the text, which is as irreverent as it is admiring, riffing playfully on Shepard’s lines. It’s also apt, as music – country pop specifically – threads its way through the piece. It’s there throughout the festival too, right down to the listening recommended in the programmes, offering space to think and feel and explore. The curious are welcome here. Music also throbs throughout O, as lightning repeatedly threatens to strike. There’s a suspended feeling of discomfort all the way through Project O’s show, leaving us braced for the storm to break even as we laugh in our seats. Performers Alexandrina Hemsley and Jamila Johnson-Small ask us to watch and to notice ourselves watching, unsettling us with the anticipation of how our responses might be turned back around. It’s our collective gaze that really feels under the spotlight. The two Os most in question here seem to be objectification and othering, both of which are obliquely referenced by Hemsley and Johnson-Small’s alternately playful and aggressive dance moves, which in turn reflect the reductive presentation of black female bodies in popular culture. It’s often funny, very funny, but laughs escape only uncertainly and in the knowledge that the whole thing could flip on its head any moment. With small gestures, the mood suddenly changes; the weather shifts. The storm clouds converge on Saturday night over The Old Fire Station. A tornado of pulsing music and flashing lights rages at the heart of the festival, along with showers of glitter and the occasional crash of thunder. The festival party, framed as an immersive club night, sits alongside Fog Bridge as one of the most public-facing aspects of this year’s In Between Time. Festival regulars are joined by hundreds of fabulously dressed party-goers, decked out as clouds, lightning bolts, poncho-clad stormchasers. It’s a real event. Peppering partying with art, it shows how this kind of work can connect with a wider local audience, who seem to be largely absent from the festival’s daytime offerings. How can that invitation be extended even further? After the storm, the flood. There’s a post-apocalyptic flavour to Jo Hellier’s Flood Plans, which hints at an all too probable weather-ravaged future. Rather than narrative, though, it relies on feeling and evocation. Submerged in darkness, we’re pelted with deluges of sound: rain falling, waves crashing, wind howling. The volume rises and rises until the noise rattles through each last sinew of the body. The aural onslaughts are punctuated with moments of human fragility, survival and connection. Isolated on the bare, black stage, Hellier and fellow performer Yas Clarke appear brittle and insubstantial, voices whistling weakly into the void. It is those bodies, though, that offer the most memorable and affecting moments. Hellier and Clarke first struggle and then embrace, their limbs surprising us with all the new ways two people can fit around one another. Against the force of storm and flood, they wrap themselves together. There’s a different sense of aftermath to Ishimwa’s Niyizi, which takes on the character of searching. History, culture and identity both intertwine and clash, as the performance tests out ways of reconciling self and heritage. Through the separation of video and live performance, Ishimwa suggests both dislocation and simultaneity, his movements in the room frequently mirroring those on the screen, but always just the tiniest fraction of a second out of time. In the first filmed dance sequence, blown up on the big screen at the back of the stage, Ishimwa sits in profile, twisting and turning. He writhes as if in an effort to crawl out of his own skin, a skin that he then – like the series of dresses he wears – gets more and more comfortable in. There’s a sense of struggle to it, but also of ritual and finally of celebration. Peter McMaster’s 27 is ritual too, at times morbid and at times joyous. It offers two visions of the post-storm world: one of death and one of hope. These two forces tussle throughout the performance, as the experience of getting older and finding one’s place in the world veers between destructive despair and a liberating gesture of letting go. The title is a reference both to McMaster’s age and the age at which Jim Morrison, Janis Joplin, Jimi Hendrix, Brian Jones, Kurt Cobain and Amy Winehouse – whose music weaves its way through the show – all died. Death, whether in the skeleton bodysuits that McMaster and Nick Anderson open the show wearing or the ash that is scattered ceremonially over floor and bodies, is thus a constant presence. While there are moments when it stutters, the whole piece is so open and tender that it begs forgiveness for any flaws. If anything, the flaws feel necessary, colouring its heart-aching sincerity and vulnerability. Stripped bare, both literally and figuratively, McMaster and Anderson share with us their bruises. And as in Flood Plans, bodies interact in unexpected ways, resisting, embracing, leaning against and catching one another. There is a storm coming, no doubt about it. But perhaps the response, as 27 begins to intimate, lies in the connections we are able to forge.